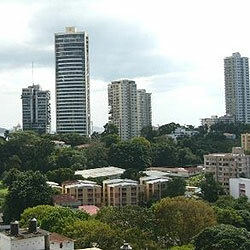 The prestigious La Cresta rests on a hill in the heart of Panama City. Try living in this luxurious residential area and you'll find yourself hobnobbing with Panama's elite, including political figures and key business people. Property here ranges from opulent mansions with Spanish Colonial architecture to more contemporary condominium units. La Cresta is ideal for a laidback lifestyle, as places to relax and enjoy the greenery are never too far. Yet all the commercial comforts are just minutes away, putting a vibrant, cosmopolitan lifestyle within reach.